Bridging the banks of the legendary Hassayampa River, Wickenburg lies at the foothills of the Vulture Mountains like an oasis in the Sonoran Desert. Though only an hour away from the hustle and bustle of modern Phoenix, Arizona's western community evokes you back to a different place in time. Founded in the late 1800s in conjunction with Henry Wickenburg's Vulture Mine, the town has evolved through the years to become a modern community rich in the traditions of the old west. Henry Wickenburg came from Prussia, lured by the dream of wealth and abundant gold. His quest was rewarded by the discovery of the Vulture Mine, where over $200 million in gold and silver has been dug from the ground. Throughout the foothills surrounding Wickenburg are relics of other mines that stand as monuments to the pioneer miner and prospector. The mining lore of the region adds much to the charm of the area in the present as it did in the past. Along Frontier Street, the town's main historic district, early businesses built lasting structures that still grace Wickenburg's downtown area. Guest ranches offered a unique western experience to tourists who fell in love with the West. The Bar FX Ranch became the first true guest ranch in 1923, followed by the Remudas, Kay El Bar, Rancho de los Caballeros, and Flying E ranches. 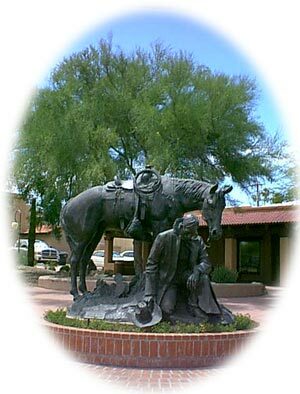 With the construction of Highway 60 from Phoenix to California even more tourists arrived, making Wickenburg the Dude Ranch Capital of the World. Today, some of these ranches still offer their unique brand of Western hospitality. Wickenburg today is a modern town with over 600 businesses providing a full range of services, shopping conveniences, specialty shops and galleries for gifts of western distinction. The western atmosphere still thrives in Wickenburg. The town has cherished the best traditions of its colorful early days through annual events such as Gold Rush Days, the famous DC Ride, and organizations such as the Wickenburg Chamber of Commerce and the Desert Caballeros Western Museum. Come discover Wickenburg's historic downtown and the natural beauty and the legend of the Hassayampa River. The Chamber of Commerce has developed a self-guided brochure of historic town buildings with a map of their locations. Numbered copper plates on the outside of buildings correspond to numbers in the brochure with ten buildings awarded listings on the National Historic Register. This red brick schoolhouse, listed on the National Register of Historic Places, was built in 1905, replacing the wooden school on this land. "Little remains of the old one-room schoolhouses built of logs, adobe, frame, or brick which proliferated across Arizona in the late 1800s.